Nukon crews work with JMT USA General Manager Nick Moutsos in setting up this impressive machine. Pretty much it’s cutting metal with light. Yep. How cool is that–? And it does it QUICK. How quick you ask? WICKED QUICK! 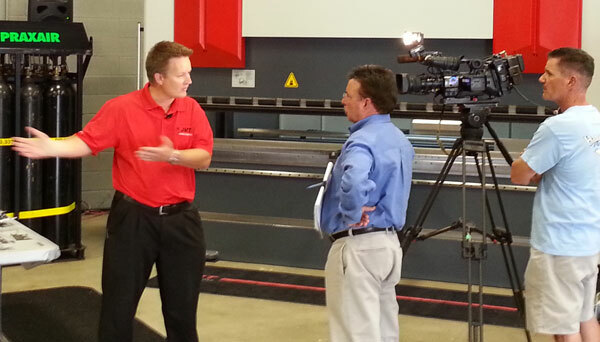 The introduction of these machines to the American marketplace is very exciting news for metal fabrication companies looking to be competitive and efficient. JMT is committed to providing it’s customers with tools that allow them to create and fulfill their dreams. 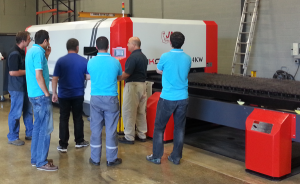 By offering the new line of Nukon fiber lasers that this company makes, that will in turn help American companies become more competitive with other off-shore tool manufacturing companies, simply because of the time and labor costs these new tools will save. 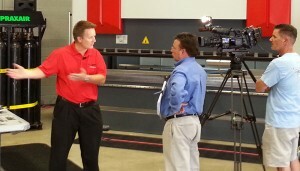 JMT USA President Kyle Jorgenson is interviewed about the new fiber laser line. With unprecedented service and sales, JMT, a $16 million dollar company, brings 40+ years of experience to the table and is always seeking better ways to help their clients in saving money and finding the most cutting edge technologies out there which will put Americans back to work. Please feel free to visit our websites for more information on the Nukon Fiber Laser at fiberlasermetalcutting.com and jmtusa.com.